MIRAMAR, Fla. - Seventeen protesters have been arrested hours after they began gathering outside the U.S. Immigration and Customs Enforcement field office in Miramar. Wednesday's protest came two days after seven protesters were arrested on trespassing charges after they held a protest outside ICE's detention facility on Powerline Road in Pompano Beach. The arrests were expected as protesters blocked the intersection at Southwest 29th Street and 145th Avenue for much of the day. 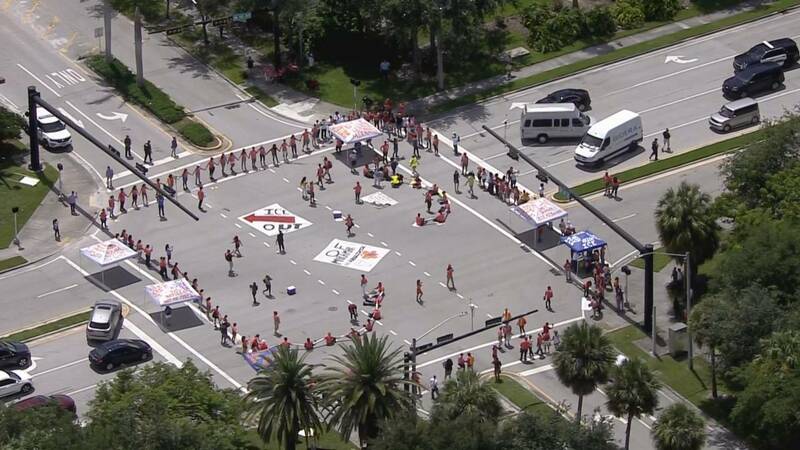 Sky 10 was above the scene around noon as a couple of vehicles were forced to make U-turns at the intersection as protesters held hands throughout the roadway. Miramar police asked drivers to avoid 145th Avenue from Pembroke Road to Miramar Parkway during the protest as they had closed all north and southbound lanes. Police later set up a command center just up the street, along with the Broward Sheriff's Office and Pembroke Pines Police Department. Authorities warned protesters over a loud speaker to get out of the street before they started arresting people. The protesters face charges of unlawful assembly and obstructing roadway. No was hurt during the protest, said Tania Rues, a spokeswoman for the Miramar Police Department. Sky 10 was above the ICE field office earlier in the morning as protesters gathered under tents that read "Abolish ICE" and "ICE Out Of Miramar." "It's something that I feel we have to do, and stand up for these families and these children that are being torn apart," protester Gustavo Contreras said. The protest played out steps from a facility where immigrants check-in with the government, and in some cases are taken into custody as part of the deportation process. "Every day from all across the state, families come to stand here and endure the harsh Florida heat, and are denied access to basic human rights, like using a bathroom or drinking water or feeding their children," one protester said. Homeland Security agents and Miramar police officers initially attempted to get the dozens of protesters back on the sidewalk, but later allowed the group to stay in the street. Traffic in the area was re-routed and organizers brought in tents and bottled water to cool everyone off. Protesters told Local 10 News it was worth getting arrested Monday to protest the immigration policies of the Trump administration. "The GEO Group, which is a for-profit prison corporation, works together with ICE to destroy black and brown lives every day. We have to put a stop to that. We have to take action," protester Christian Minaya said. Two protesters locked themselves to a fence with a bike lock Monday, while others tied themselves to a car blocking the entrance of the facility. "(The protesters') actions are misguided and based on a mischaracterization of our role as a long-standing service provider to the federal government, and totally ignore the fact that we have absolutely no role in setting immigration policy nor have we ever advocated for or against immigration enforcement or detention policies. "Furthermore, the facilities we manage on behalf of the federal government have never housed unaccompanied minors. For over three decades, our company has managed ICE Processing Centers providing services for adults, and we have managed the Karnes Family Residential Center, which has cared exclusively for mothers together with their children since 2014 when it was established by the Obama Administration. "On a daily basis, our dedicated employees deliver high quality services that comply with performance-based standards set by the federal government and adhere to guidelines set by leading third-party accreditation agencies. Our more than 23,000 GEO employees around the world are proud of our record in managing facilities with high-quality services in safe, secure, and humane environments. Members of our team strive to treat all of those entrusted to our care with compassion, dignity, and respect."